These are not only the best pancakes I’ve ever tasted, but also the healthiest, and I’ve tasted way more than my fair share of pancakes. Our good friend Klaus surprised us with these at breakfast when we visited him in California (where else would you find something this healthy) and the flavor just blew us away. They’re made with Bob’s Red Mill High Fiber Hot Cereal instead of flour, and have walnuts, raisins and dates mixed in. I know it sounds a little busy for a pancake, but give this recipe a try, then top the pancakes with a dollop of yogurt and some fresh fruit and real maple syrup and I guarantee you’ll never go the Eggo or Aunt Jemima route again. And, as an added bonus, they freeze really well, so you can make up a big batch, freeze the leftovers, and just pop them in the toaster oven anytime for a quick, delicious, nutritious breakfast. 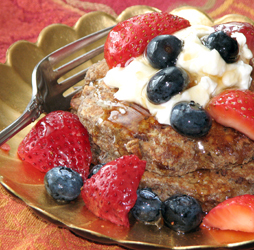 These did turn out to be the best pancakes I ever tasted…can’t believe they tasted that good and that they’re healthy, too…great recipe!